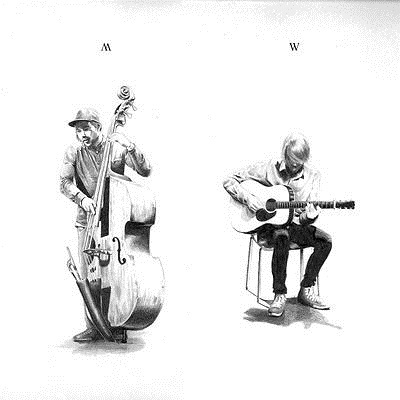 Christian Meaas Svendsen and Christian Winther presents W/M – a double solo (mostly) album with two cds in it, one for Christian M’s work and one for Christian W’s. It might look strange at first to discover a double album that actually brings together two solo acts, but upon listening to the albums and to the collaborations between the two artists, who play together on “The Tasty”, “Cloudberries, “Art”, “Entropy, Dissipative Structures” and “C2 Blues” (I love their track titles), one gets to understand the connection and even importance of this dual feature. Christian M’s weapon of choice is the double bass, while Christian W plays the acoustic guitar. Both of them, each in his own realm, show tremendous and strict control while creating their music, which turns and twists through free jazz that mocks both chaos and form. There is a healthy sense of humor in here as well, from the confident titles of each track to the music that allows a certain degree of game playing that gives great depth to the skillful music playing. Va Fongool releases many remarkable albums, and so far I can say that their signature can be taken as a sign of trust that the album in question is going to be rewarding, even when you’re not such a big Jazz fan like me.